Open since 1988, the Bordelais has evolved to provide a first class restaurant with a classic French wine list. With a bar and brasserie next door, showing major televised sporting events, we therefore cater from a croque and a beer to a Ballotine de Canard aux Pistaches with a glass of Chateau Filhot. Some of our produce comes directly from France. Our head chef is always pleased to discuss party menus. 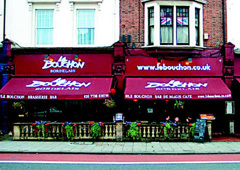 A first class French restaurant serving classic French cuisine with a brasserie adjacent serving lighter bar meals and snacks. Hey, youre the goto epxret. Thanks for hanging out here.